FlashFace is a brandnew app for sketching human faces. Be a detective and draw the faces of your most wanted persons with the FlashFace app! 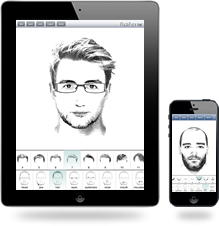 Create face sketches on iPad, iPhone or iPod touch in just minutes. There are ten types of facial components at your disposal. Save created faces so you can open and edit them later. Export your sketches to the photo album and share them everywhere you want. There are three app versions: FlashFace Free, FlashFace Full and FlashFace Woman. Do you have questions about FlashFace? Do you want to submit a bug report or feature request? Then feel free to write us a message!